Now you can apply up to 50,000 square feet of solution in less than one hour. The Liquidator has a 36 gallon solution capacity, along with an adjustable applicator brush to accomodate obstacles and narrow aisles. 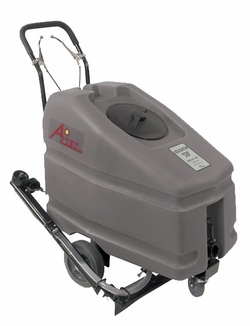 You'll quickly realize the benefit of using the Liquidator as part of your floor maintenance solution. Adaptable — Adjustable applicator brush adjusts from 26" up to 56"
The Liquidator is a key component of the Sidewinder WorkSmartTM stripping system. Only the Liquidator can lay down strip solution fast enough to stay ahead of the Sidewinder stripper. Don’t work hard, work fast and smart with the Aztec WorkSmartTM stripping system. Stripping solution usage is reduced by an evenly controlled flow from the 36 gallon polyethylene tank. The Liquidator is manually powered with NO batteries, NO motor and few moving parts. The Liquidator is also easily portable and	virtually maintenance free.